Warfare between the rival Escher and Goliath gangs. The new screenshots show warfare between the rival Escher and Goliath gangs in the cavernous domes and rusted corridors of the Underhive. Necromunda: Underhive Wars is the first video game reimagining of Games Workshop’s iconic tabletop game. With a unique setting and grounded perspective of the Warhammer 40,000 universe, it features a new take on the franchise and blends fast-paced tactical combat with RPG elements and deep unit customization , coming to PlayStation 4, Xbox One, and PC. For an even deeper challenge, Conquest Mode offers endless gameplay featuring 4X mechanics between the turn-based battles. Fight over key territory to take complete control and prove your gang as the most fearsome in the Underhive ! Every fighter is customisable in loadout and appearance, letting you change everything from body size to armour and weapons. Take your unique gang online, challenging other players in competitive online multiplayer. Adaptation of the hit tabletop game set in the Warhammer 40,000 universe. Fast-paced tactical strategy game with customisable gangs. Unique atmosphere set in the deadly Underhive featuring expansive, vertical environments. Intense solo campaign showcases the distinct Underhive gangs. Win or lose, your gang’s injuries and deaths are permanent: each decision matters! Conquest Mode features 4X mechanics in an endless struggle for control. Challenge other players in online multiplayer. 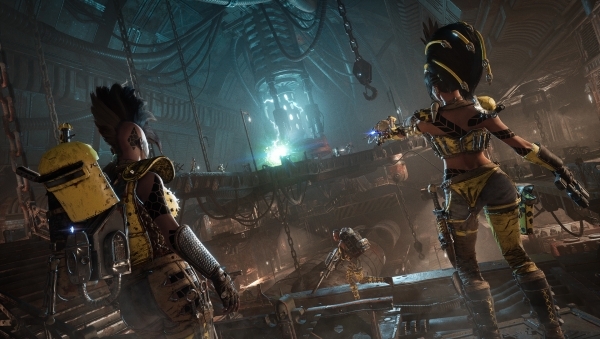 Necromunda: Underhive Wars is due out for PlayStation 4, Xbox One, and PC in 2019.